I’ve become a little obsessed with cleaning lately, I’m not sure if it’s having more time since the children are in school full time or if it’s just a symptom of my current nesting frenzy but I’ve been spending some extra time each day cleaning when I wouldn’t have before. I’m trying to be really organised and give myself a little cleaning schedule so that I can keep on top of all the cleaning tasks, specifically the ones that need doing monthly or less often. 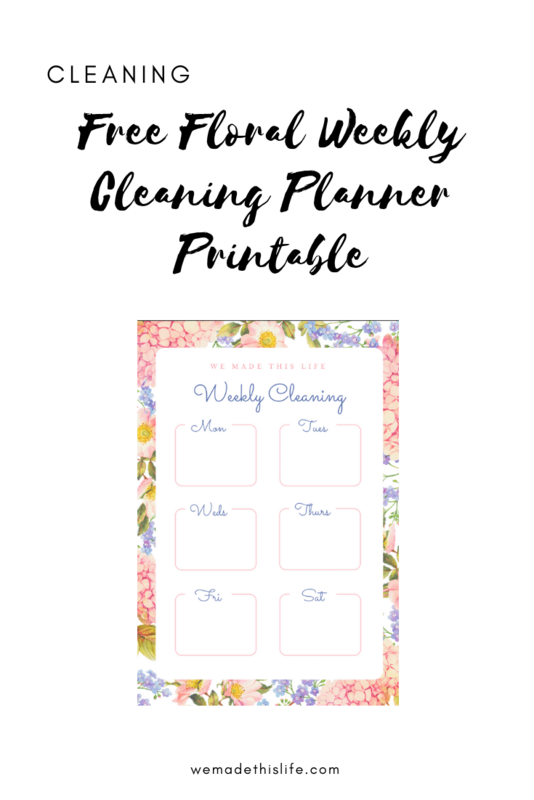 Today I thought I would share with you a free printable that I made to help me get on top of the cleaning routine for the week. I also have a monthly cleaning list (which I will share with you soon) and every week I pop a few things from that list onto my weekly schedule so that I know that they are getting done. I then tick them off the monthly list. On a day to day basis I generally clean the sinks and toilets every day and try to hoover and mop every other day. I tend to do a day of washing and drying every other day and ironing the same, every other day. We also have a cleaner come in once a week to give me a day off and give the whole house a real spruce and clean. I keep this cleaning planner on the fridge and I fill out a new one every week, ticking off the tasks as I do them. I find that with it on the fridge for everyone to see it really gives me the motivation to tick those things off! It’s also really pretty so I don’t mind it being on display! You can download your copy for free here. I’ve also made a video over on my YouTube channel about some of the cleaning products that I have been using lately and talking a little more about my cleaning routine.